-Make sure your "C" terminal is either connected to the Battery "+" or a Key switch, Othersise, Meter will scan from full to empty then shuts off . -Meter will stay full position while first is connected with batteries and indicate the actual battery level after 155 seconds. -Please connect the correct voltage to your battery indicator as noted on your model . Failure to connect to the correct voltage will damage the batery indicator causing it to function abnormally. -Once battery was fully charged, Meter will cycle through for continuous 6 minutes then stay "full" position. -The Battery Meter works on Lead-acid Batteries only. -The batteries voltage is displayed using a 10 segment LED bar graph(1 Red, 2 Yellow and 7 Green LEDs) display from full (far right green LED) to empty (far left red LED). -The second LED from the left flashes as a warning that the batteries voltage has been discharged to 80% of their capacity. -At a 90% battery discharge, the red and yellow LEDs will alternately flash to indicate a very low voltage capacity is remining. -It is strongly recommended to recharge the batteries when you get to the 3rd Yellow LED, this is a safety precaution to avoid dead batteries. -Operating and Storage Temperature: -20℃ to 85℃. -Net Weight: 21g / 0.8oz. 1, Meter cannot move to full charge. This happens when battery was fully charged but the battery voltage cannot reach to preset fully charged voltage of meter, just disconnect the meter from power and reconnect, meter will reset to full. This occurs if your "C" terminal is not connected, make sure your "C" terminal is either connected to the battery + or a key switch. 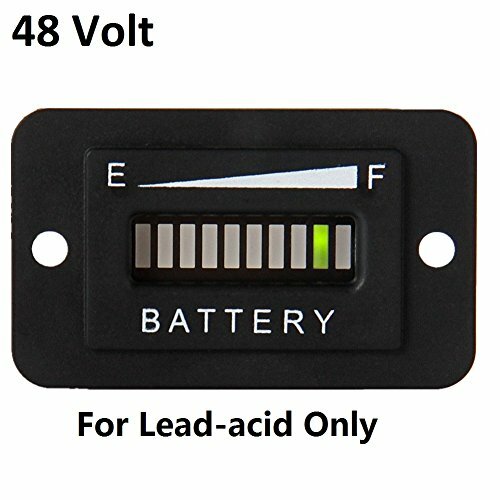 2016 Brand New LED battery Indicator works on 48 Volt Lead-acid batteries to monitor the charge/discharge status of your batteries. The batteries voltage is displayed using a 10 segment LED bar graph(1 Red, 2 Yellow and 7 Green LEDs) display from full to empty. At a 90% battery discharge, the red and yellow LEDs will alternately flash to indicate a very low voltage capacity is remining. Once battery was fully charged, Meter will cycle through for continuous 6 minutes then stay "full" position. If you have any questions about this product by SEARON, contact us by completing and submitting the form below. If you are looking for a specif part number, please include it with your message.